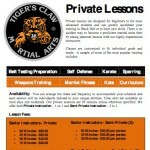 Professor Mertz and the Staff at Tiger’s Claw MA offers private & semi-private lessons for Children and Adults in Ishin-Ryu Karate, Self-Defense, Tiger Commando Fighting System, Kata and Weapons. Days, evenings and weekends are available. Available for corporate training. Please call for details.